Hi, parents! I know there’s a handful of parents that are coming to supervise their children who are K-Pop, K-beauty, or Korean culture fans. 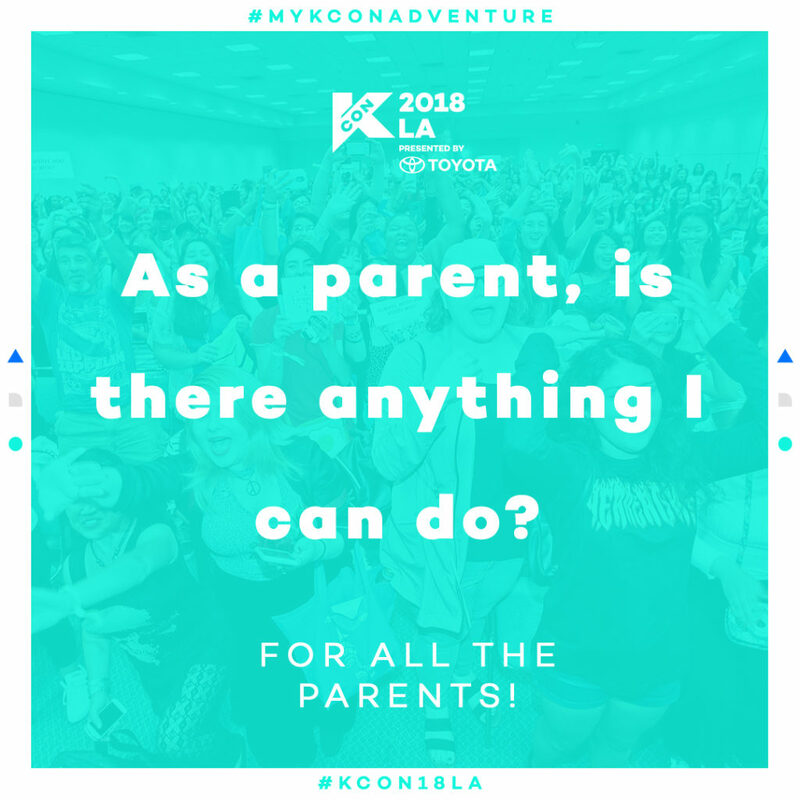 Other parents are probably coming to KCON for some family fun! And of course, there’s a handful of parents who are K-Pop fans themselves, ready to share their love for the music and culture with their children! To you all, welcome to KCON 2018 LA! We have designed a sample itinerary to help you and your family navigate the 3 days of programs. All the programs included in the sample itinerary can only be accessed at our KCON Convention, which means you will need to purchase a Convention wristband. If you have one already, you’re ahead of the game and can move on happily to the next section. If you do not have a Convention wristband yet, there is no need to worry. You can still purchase and register a 3-day wristband for $30 each on this website or on-site. We highly recommend you and your family register your wristband online as on-site registration will take some away and you might miss some of the exciting programs we have prepared! In order to receive any applicable goody bags or artist engagement vouchers, you will need to check-in before you are able to access the Convention Hall. You do not need the whole family present to check-in everyone. Just make sure you have your registration confirmation, ID, and all other required information so you do not have to exit and re-enter the line. We highly encourage you to do early check-in on August 9th or as early as possible, especially if you have purchased artist engagement packs! With how hot summer has been this year and how big the LA Convention Center is, make sure you and your family have plenty of water! To help our fans and families stay hydrated, we have added a water bottle to our merchandise list. You can use the water bottle at any of the water refill stations found within the convention center. We also have other cool merchandise you may want to get to remember the KCON weekend. All merchandise can be purchased at the merchandise booth in K-Pop World. Onsite, we will be notifying our fans of any changes in the programming scheduling, announcing any artist booth appearances, and sending out important reminders. Please make sure to download the KCONUSA app (iOs | Android), and follow us on social media (Instagram | Twitter | Facebook) for realtime updates. It will be well-worth the minor annoyance of push notifications so that you know why people are rushing towards a certain direction or to which booth or program your child may have secretly rushed off on his or her own. 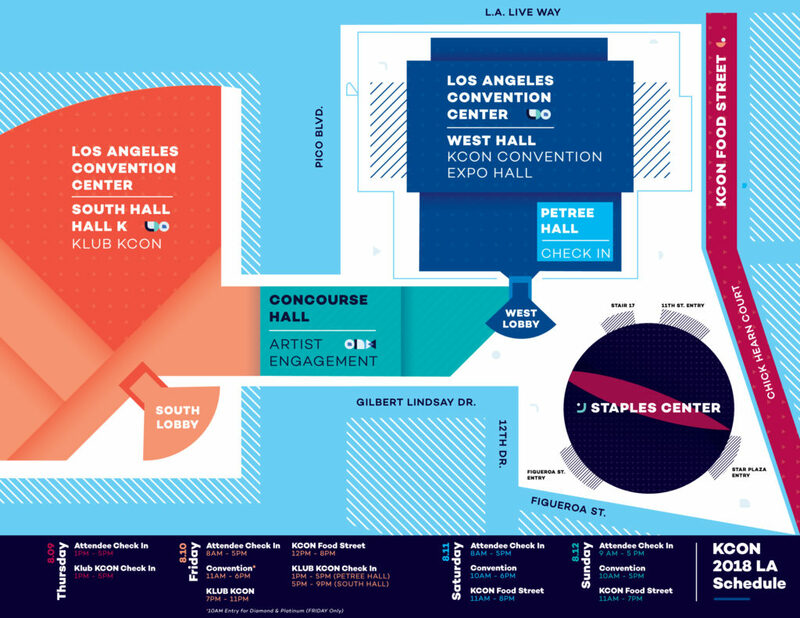 As mentioned earlier, the convention hall is huge and you will probably want to familiarize yourself with the KCON Convention layout before the Convention opens especially if your children are interested in different programs. Make sure you recognize the general names of the different zones, so you can relocate and reunite with your family throughout the day! With all that information done, we can move on to the actual itinerary specifically designed for PARENTS! The itinerary assumes you have already checked-in prior to the Convention start time. Of course, the programs listed below are what we think parents (and their children) will enjoy and you are free to take or add programs from this sample itinerary. Now, the official convention and KCON won’t start on Friday. But I just wanted to share with you and an exciting event for you and your family. 6:00 – 8:30 PM: Free Screening of The Fortress. Join us at the UCLA Hammer Museum for a free screening of the event. Free tickets are required to enter the venue and you can get yours at the Hammer Museum box office beginning 5 P.M. Each person can only get 1 ticket, so make sure your whole family is present to receive enough tickets. Event is first-come, first-serve. Convention programs won’t start until 11:30 AM, so you can use this half hour to get yourself acquainted with the KCON Convention. Petree Hall: This is the registration and check-in area. You’ll need to stop by at least once to check-in and receive your physical convention wristband. West Hall: This is the area where you can experience all of our convention panels and workshops or even join our Global Audition. If there’s a panel you or your family are really excited about, you will want to get a seat early. 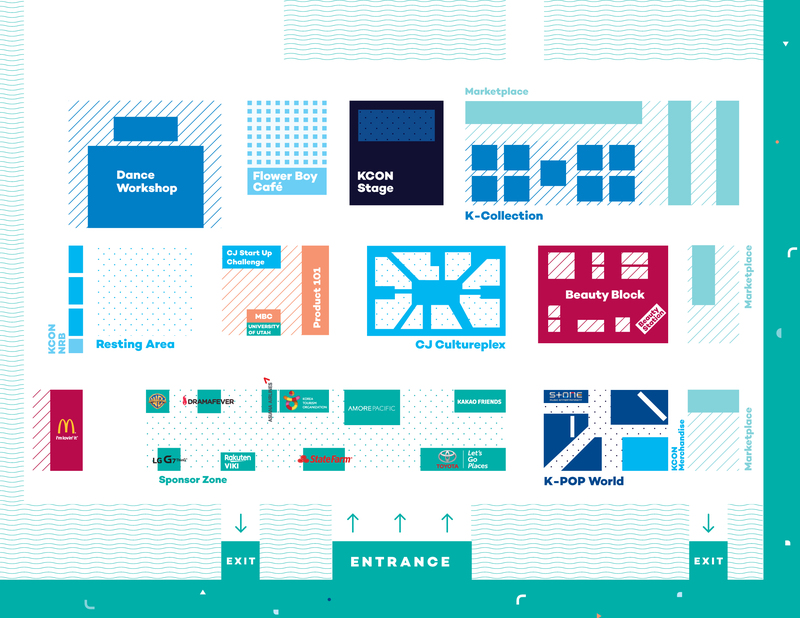 Concourse: In this zone, you can find our market, sponsors, Beauty Block, KCON stage, Dance Workshops, and K-Pop World. A lot of sponsors have great things to check out, purchase, or win, so it’s a good area to explore before it gets too busy. Plus, our official KCON Merchandise Booth is here. Get your merch (i.e. water bottle) before they sell out! Concourse Hall: This is a separate closed area within the overall Concourse. Concourse Hall is where all the artist engagements and Red Carpet will take place. 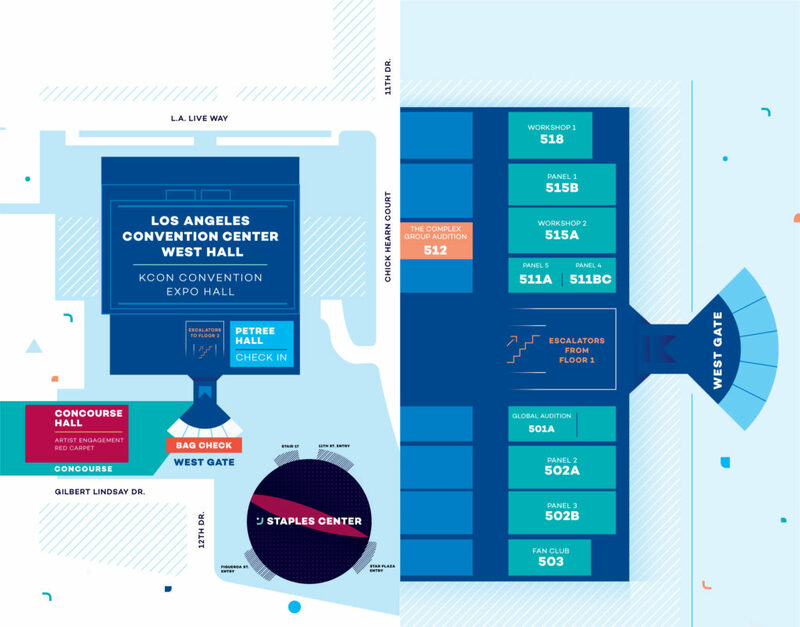 South Hall: Here is where KLUB KCON will take place. As parents, any big, crowded area probably spells disaster especially if you have younger children. So make sure designate a meeting point just in case you get separate from your children. 11:30 AM – 12:30 PM: How To Live and Study in Korea with Go! Go! Hanguk! If you are a parent of a K-Pop fan or your child is curious about Korean culture, you might want to check out this panel. You’ll be able to find out what you can expect living in Korea and your child can find out how they can go to Korea to study! As the title of this panel suggests, parents, you are not alone! Here, you will be able to meet other parents whose children are K-Pop fans and hear how the children have tried to convert the parents to K-Pop (or are still trying to do so). You’ll probably hear some interesting stories and anecdotes from fellow convention attendees. Just in case, you weren’t able to walk around the convention a lot, we added a dance workshop to get your body moving! Join us in learning the moves to the catchy Momoland tune “BAAM” and you won’t need to need to go to the gym later tonight! So get your light-up shoes on and get ready to dance like Momoland! Welcome back to the second day of the convention! We have another packed day for you and your children! If you or your children are Korean beauty fans, you might have heard of Irene Kim, model and host of popular Korean beauty & fashion programs such as K-style. Well, now’s your chance to meet her! She will be having her meet & greet panel where she will be talking about her journey as a model and answer questions you may have! Just because you’re older doesn’t mean you can’t fangirl or fanboy over your favorite idols. Join Amy from the Ahjummas and other special guests at this panel to see how older adults adopt their Hallyu fan identity! Who knows, you might feed off their passion and excitement and come out a K-Pop fan as well! You can never have too many recipies in your cooking repertoire! Stop by the Korean Food Workshop with Bibigo to learn how to make some of our favorite Korean dishes. If your children don’t follow you in, surprise them with what you’ve learned for dinner tonight! Release your creativity at this workshop moderated by Susie Kelly. Your younger children will love this workshop as they get a bit hands on and messy! Now it’s time for probably what a lot of your children were waiting for: the MCountdown concert! Take your ticket and head on over to the Staples Center. Get ready to Dance the Night Away with Twice or watch Wanna One Burn It Up! Props to all the parents who accompanied their children all weekend long! We are now at the last day of convention, so let’s go on with another eventful day! Hang around the KCON Stage to watch a Taekwondo performance by KTO. The athletes will be performing punches and kicks that should be physically impossible, so it will definitely be a sight for your children to enjoy! I hope you haven’t let the KCON Stage because next up is a performance from one of this year’s super rookies, fromis_9! These cute girls are sure to make your heart go DKDK with their performance. You won’t be able to keep your parent smile off your face! Both dramas have been sweeping TV ratings within Korea and are now at KCON 2018 LA for a free screening. In this screening provided by Viki, you’ll be able to just sit back, relax, and immerse yourself in the funny antics and dramatic plots of the two shows. Your children won’t be able to keep their eyes off the screens! If you have a K-Pop fan at home, you might have heard of the show “Running Man,” in which cast members compete in challenging and hilarious games to avoid punishment. Well, now’s your chance to challenge some of your favorite Running Man games at our Running Fan workshop. The workshop will be open from 2:30 to 5:00 PM, so drop by with your family for some friendly competition! Wrapping up KCON will be our final night of the MCountdown concert! Our lineup is packed and the performances will be awesome you won’t be able to get the songs out of your head! Well, that’s it for this sample itinerary. We hope it helped you plan out your KCON 2018 LA weekend. Some time slots have been intentionally left black so you can walk around, take a breather, drop by Food Street and Beauty Block, or whatever you see fit! Make sure to check out the full Convention Schedule. I hope you an amazing time at the Convention with your family! Let’s KCON!